In many corrosive or/and abrasive applications, PTFE or PFA lined ball valves and metal seated ball valves are used, but limited to the material, these PTFE or PFA lined ball valves and metal seated valves cannot last for a long time due to severe abrasion and corrosion. Floating Ceramic ball valve have excellent performance and much longer life time than soft seated and metal seated ball valves in most corrosive and abrasive applications. Some typical applications listed below (but not limited to these applications) where FUVALVE Floating Ceramic ball valve have been widely used all over the world: Silicon Powder,Alumina Powder,Dry Coal Powder,Limestone Slurry,Gypsum Slurry,Plaster,Fly Ash,Mining Ore,Coal Powder Injection,Metallurgical dust,Thermal Power plant FGD,Petroleum Solid Catalyst,TiO2 suspension with sulfuric acid,Ammonia solution with powder,Hydrochloric Acid,Liquid Chlorine,Bulk Material. FUVALVE Floating Ceramic ball valve can fulfill existing connection requirements such as face-to-face dimensions and customers’ existing flange type. Ceramic components are assembled into forged metal body of Floating Ceramic ball valve which absorbs most physical loads and shock from piping lines. Actuator is connected to Floating Ceramic ball valve by a yoke that meets ISO 5211 specification including most pneumatic and electric actuators. The yoke is re-movable and easily modified to meet special requirements. Levers operated methods are also available for Floating Ceramic ball valve. Cold Isostactic Pressing (CIP) and high-temperature sintering nanometer high-purity 99% Al2O3 and 99.7% Al2O3 (alumina) and ZrO2 (zirconia) ceramics will not interact with almost all organic and inorganic chemicals, nor contaminate process medium. Their physically and chemically stability against most acids, salts and alkalis will last for many years with little or no corrosive degradation, which make sure that Floating Ceramic ball valve have excellent performance in corrosive applications. The hardness of 99% alumina ceramics is about HRA88, harder than zirconia (about HRA85), solid tungsten carbide is about HRA 90,which is about 8 times harder than stainless steel. As valve trim, ceramic components make Floating Ceramic ball valve work well in the most severe abrasive conditions, such as pneumatic conveying to transport silicon powder, coal powder, Mg powder, etc. The perfect fine grinded spherical seal between ceramic ball and seat ensure a Class VI shutoff. The anti-scratch design between ball and seat, which prevent sealing surface from being scratched by particles. The ceramic ball will not be stuck so ball will not be broken. 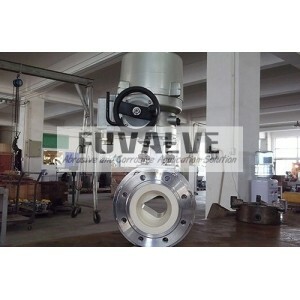 FUVALVE offers all size of Floating Ceramic ball valve two different port: Round-port and V-Port balls. In general, the round-port ceramic ball valve is often used as an on-off valve. If precise and stable control performance is required in any corrosive and abrasive applications, V-port Floating Ceramic ball valve with equal percent characteristics may be the best choice.